This green DVF (sim)/Anthro belt outfit was first seen on the blog here. It was EXCELLENT for my first day back at work after a 10-day trip to KL and Dubai (read: roomy!). Pardon the droopy scarf on my red work bag - it couldn't deal with the idea of being back at work either. The tan sandals are old Kenneth Cole wedges - which have cushioning on the sole that make me feel like I am walking on pillows! No surprise they are my favourite commuting shoes many years on. On the left, the Hermes scarf finally picks up the slack and gets its bow back on. And so do I - in an old Anthropologie top I borrowed off my dear friend Kara. I have multiple pairs of J Crew Minnies (pants are the only occasion I make an exception to my rule of "no multiples") - it's the perfect zero-alteration-needed length for my 5'4" stature. This white belt is from K Karl Lagerfeld and my ballerinas are from My Ferragamo - which are the comfiest pair of shoes in my entire footwear collection. Period. And they make for the best travel shoes too: see exhibit A and B. This is my favourite dress to wear on a Friday. Alas, the colour and shorter hemline of this Lilly Pulitzer frock is only suited for my corporate setup on the last day of the work week. My summer work bag is the Hermes Garden Party (in Rouge Casaque if you care about these things) and it holds everything but the kitchen sink. My sandals are the ever-sparkly Tippsy Glitter sandals (on sale here!). Rest assured I put on a blazer and switched into pumps as soon as I got into work. 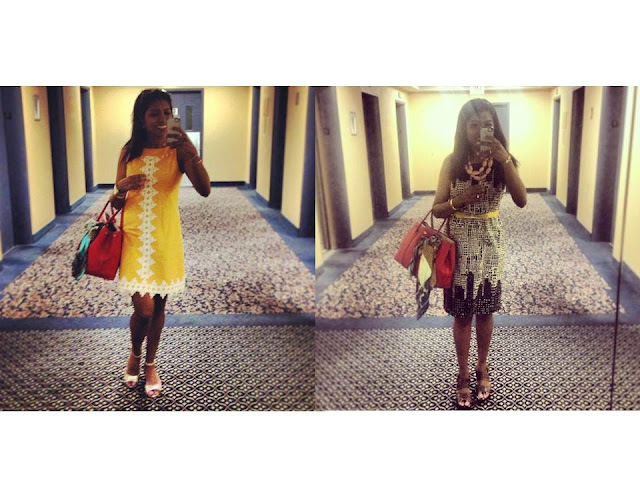 The Anthropologie Great Heights shift dress on the left is a piece that will stay in my wardrobe forever. The black and white palette allows me to add personality with accessories - this time with a bright yellow belt from Hong Kong and salmon pink baubles from Dinosaur Designs. The Kenneth cole wedges make an appearance again but the scarf decided it had enough of work and went all flopsy on me. Here I am testing out my work bathroom mirrors. The outfit on the left is an all-Leifsdottir ensemble- can't remember the name of the blouse but the skirt is the Sloping Skirt which also came in black. You can't really tell but I have on J Crew Valentina shoes in leopard. Red and Leopard - clearly I push the boundaries around here. Next up is evidence of the rare occasion I buy things full price at Anthro - the Cerise Shift Dress. It's a beautiful dress, and even more splendid with a long necklace (a strand of pearls in this instance). On my feet is the MVP of the month: my custom-made Ferragamo Vara. I did not lie when I said I wore these shoes non-stop - and based my outfits around them all-week. This dress is from Osklen - a brand I am unfamiliar with but I gave it a go because it was heavily discounted on Shopbop. Purchasing outside my comfort zone worked in my favour - love the print, love the easy-to-care fabric even more. But the really cool double-zip design sealed the deal for me (see the model shot here). Lastly we have the blues. 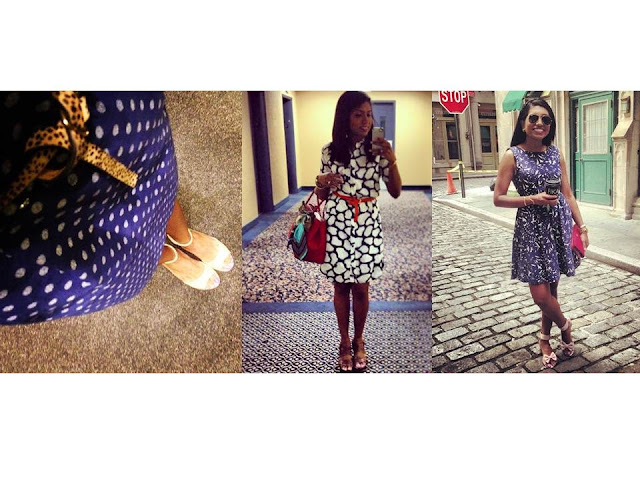 This J Crew polka dot dress is not new to the blog - you last saw it here. This dress is another one with a questionable hemline - probably why I was too scared to take a head-on picture of the outfit. It looked great with this Anthro leopard belt and aforementioned glitter sandals though! DVF can do no wrong when it comes to work dresses. This giraffe print shirtdress is the epitomy of the playful-conservative look I strive for in the office. It came with a matching-fabric belt that I rarely use however. I prefer to cinch my waist with a different coloured belt each time, donning a bright orange leather one from Zara on this particular day. And finally, I bribed a friend with coffee if she took a quick picture of me on cobbled-stoned Stone Street (ha!) right by the office. This is a very old Zara dress - one of the few dresses I wear all-year round due to the thicker cotton fabric it's made of. On my feet are my happy shoes - Red Valentino bow sandals which you last saw here. I couldn't bare to take them off when I arrived in the office so they stayed on until I had to run to a meeting at lunch. 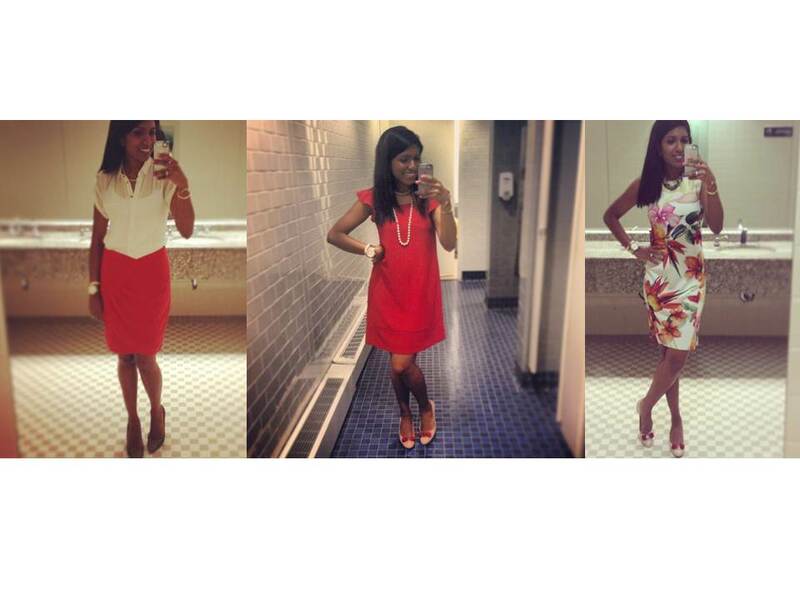 There you have it - I am clearly a dress girl and I embrace colour like it's going out of fashion. Not a bad way to dress as I work towards the C-suite! It's official - I need those Ferragamo My Joys (I did get a custom pair of Varina's after seeing your post - want a pair of Varas too! Next month for sure). And I love this whole roundup of work outfits! Hi, Love your outfits a lot. All these styles are truly attractive and perfect for you. 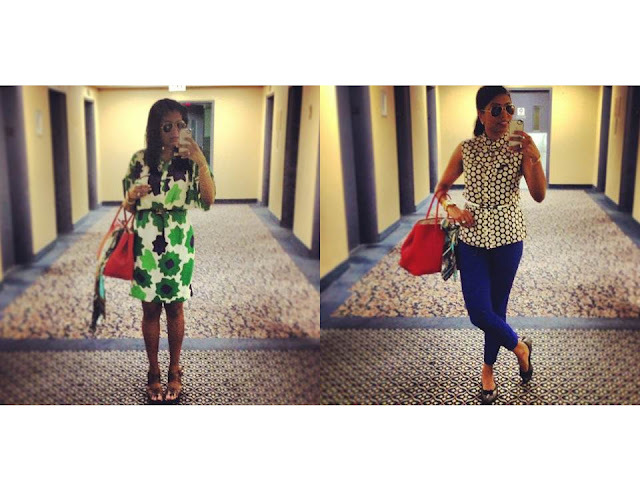 Usha, I love the fact that you have done a work outfit post! Thankyou!! I can't decide which of your outfits is my favourite: they're all so nice. While I was reading this post I got to pretend for a minute that we still shared an office (back when I used to see your outfits each day!). Also, sucha small world! I know Kara from TPF! Wow! This is a plethora of wows! I do feel like in summer you can get away with more outrageous hemlines and colours (provided the workplace isn't TOO air-conditioned...) I am in awe of your everyday, girlie! Deine Outfits sind immer richtig klasse. Da wird man schon etwas neidisch, dass man so etwas selbst nie tragen kann.